To be released beginning on February 27, 2018. The release will be published in batches over a space of a week to ensure stability. So, some changes may not appear on your account for up to 7 days after the release date. The Version 5.18 release includes the following changes and enhancements. Wild Apricot is introducing its very own payment system: Wild Apricot Payments, powered by AffiniPay, a payment gateway that specializes in payment solutions for associations. Wild Apricot Payments will be available beginning on March 12th. There are several advantages to choosing Wild Apricot Payments over another payment processing system. For more information, see Wild Apricot Payments. Registrants for simple (RSVP) events can now add guests. They can indicate the number of guests they wish to bring, up to the limit you specify. You can now allow people on your event waitlists to be automatically registered when spaces become available. On the Waitlist & settings tab for each event, you can turn on automatic registration. With this option enabled, people on the waitlist will be automatically registered to the event in the order they were added, as sufficient spaces open up. If the next person on the list together with their guest(s) exceed the number of available spaces, then that person will be skipped and the next person on the list for whom there is sufficient space – taking guests into consideration – will be registered. If there's a registration fee associated with the registration, an event registration pending email will be sent to the registrant, and an invoice will be automatically generated. Whether an invoice email is also sent depends on your invoice settings. If the event is free, an event registration confirmation email will be sent. If you enable automatic registration, we recommend you choose to collection all event registration information when adding people to the waitlist. If you choose the manual registration option, then people on the waitlist can be manually registered by an administrator or by themselves once spaces become available. When an existing registrant cancels their own event registration, the admin version of the cancellation notification email will alert the event organizer to the new spaces and provide a link to the waitlist. 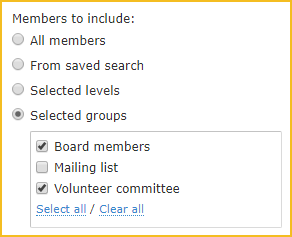 You can now use member groups, instead of membership levels or saved searches, to control who appears in a member directory. Clicking the Send notification button after manually registering a contact for an event now sends the notification email to both the registrant and their guest(s), if the email address of the guest(s) are stored in your Wild Apricot database. The transition from our old help site – help.wildapricot.com – to our new one at gethelp.wildapricot.com is complete. Any links to the old site will now be automatically redirected to the appropriate page on the new site. Help content is now also available within Wild Apricot itself, via a help panel that opens when you click the blue Help & Support tab along the right side. For information on using the new help panel, click here. 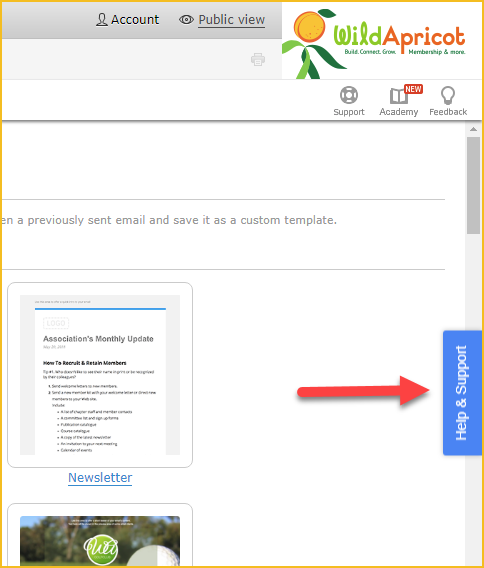 Clicking the Support icon on the right side of admin view now takes you to the Support portal (support.wildapricot.com) where you can submit a support request and view FAQs. Previously, it took you to a screen within Wild Apricot that linked to the Support portal.